It has been many, many months since I've been able to find time for reviews. As I try to catch up, just a little bit, I find myself turning to one of the CDs that hasn't been waiting for months, but which has nonetheless insinuated itself onto my CD changer and refused to let go. Figures, of course. 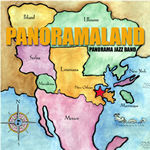 It's the New Orleans band, Panorama Jazz Band, and their new album is appropriately entitled, "Panoramaland." If you love Frank London's Klezmer Brass Band (review of the new Carnival Conspiracy coming very, very soon) or New Orleans Jazz or Zlatne Uste or just love to dance, this is a good place for reviews to start again. Want to help Katrina victims out? Buy this wonderfull CD and then hire this band! !